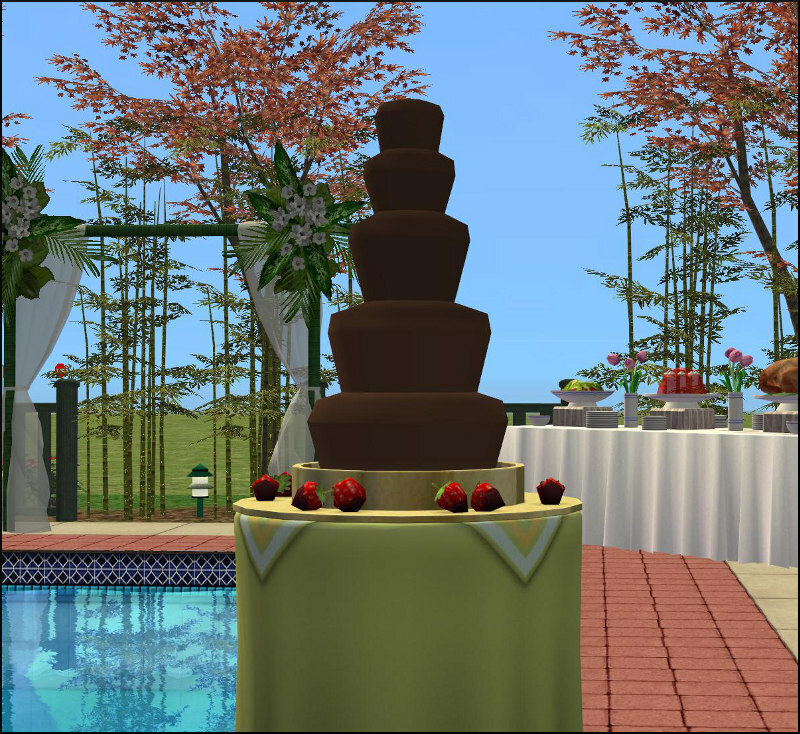 The Fountain of Decadence from Sims 3 Romanza Ceremony store set converted for the Sims 2 and made functional. The chocolate has a subtle animation (it flows down and swirls in the bottom of the fountain) and your sims can dip strawberries and eat them for a boost to fun and hunger. If you get the pets version, your sims can spike the chocolate as well which will increase fun a bit but it's mainly just a cute animation -- your sims won't get drunk from eating strawberries from the spiked fountain or anything like that. The fountain can be placed on all surfaces but the animations line up the best when it's placed at table height. The animations/effects are a bit wonky. Most noticable are the teen animations (they stab themselves in the forhead when eating the strawberries) and when sims spike the chocolate the bottle doesn't quite reach the fountain and it still has the soap effects included from the original animations. In addition, the sims eat the whole strawberry -- stems and all. amovitamsim has a decorative version of this fountain available here. Her fountain is base game compatible and has a lovely, high gloss sheen on the chocolate. Update 2/13/2016 Removed the broken Any EP option. On this version the "dip strawberries" interaction was showing up on any viewable object. Sorry for the inconvenience! Ooh ooh ooh!! This looks SO awesome!! Thank you!! I always prefer objects that are functional if they can be. Thanks for this - much appreciated! Looks like great fun, Honeywell does it work on community lots too, cos would be a great addition to a hotel.